Very similar in appearance to Neottia (Listera in America) cordata, this orchid is differentiated by its overall green colour, and also because it is slightly larger than its diminutive relative, Neottia cordata (Listera cordata var. cordata in America), which has a copper-coloured tinge to its flowers and the stems. Both species flower in America. 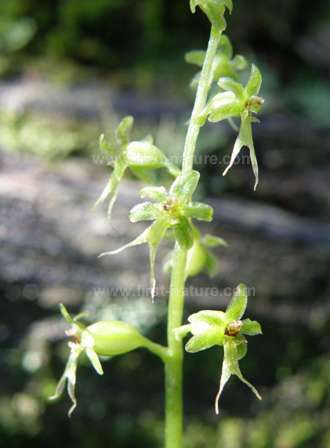 Western Heart-flowered Twayblade grows in somewhat drier habitats than Neottia cordata and reaches around 10 cm in height. Its range extends from the Rocky Mountains, north to Alaska and west to California, but it is less common and hard to find due to its small size and colouring. 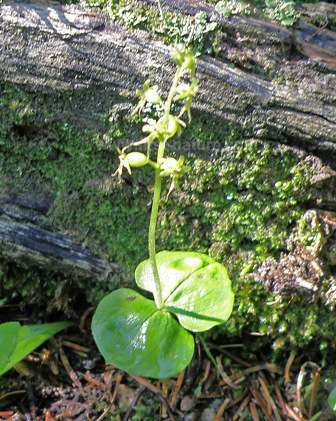 The name twayblade refers to the pair of heart-shaped leaves (two blades) near the base of the plant. The flower spike is usually between 5 and 10 cm tall and the individual flowers are green. It flowers in July. The specimens shown on this page were photographed in Rocky Mountain National Park in mid-July on one of the high altitude trails.